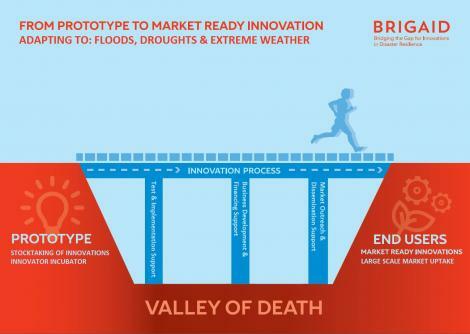 The objective of the BRIGAID project is to provide structural support for innovations in climate adaptation by developing a combination of testing and implementation methods, as well as market and investment/financing tools, that are expected to become a standard for climate adaptation innovations. CRED works on identifying, selecting and improving technological and non-technological innovations designed to protect or mitigate the impact of extreme weather events. CRED is also involved in the development of a comprehensive, standardised methodology (the Test and Implementation Framework, or TIF) for testing and implementing climate adaptation measures, in particular to assess their potential to mitigate risks from floods, droughts, and extreme weather. For more information, contact Joris Vanloenhout.